Alessandro Cavadini’s great film about the Aboriginal tent embassy, Ningla – A’Na is screening at the Museum for Contemporary Art at Circular Quay in Sydney on Thursday July 12th at 5 pm as part of NAIDOC week events . The film will be followed by a panel discussion with Paul Coe and Michael Anderson central figures in the protest 40 years ago. Details check here. Ningla A’Na will also screen in Toronto at the First People’s Cinema: 1500 Nations; One Tradition at the TIFF Lightbox. TIFF Lightbox is the cinematheque operated year round by the Toronto International Film Festival. The Toronto programme is an excellent cross section with some great films not only from Australia but some memorable New Zealand pics. Check the Toronto programme details here. We're nearly there on our ASIO intelligence series - Persons Of Interest. Picture editing on three of the four episodes is now completye and there's about a week's work left to do on the fourth. Music is well underway with one episode complete and the second due late next week. Sound editing begins in a fortnight. So even though it's been a long journey the end is now in sight. Hopes are high that our viewers will like it but you can never tell until an uninvolved audience see it. 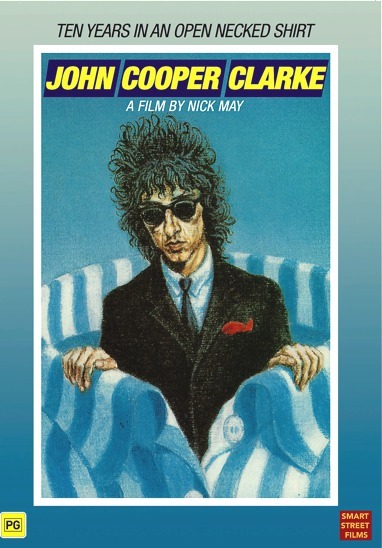 John Coooper Clarke in "Ten Years In An Open Necked Shirt"
Smart St. is pleased to announce the re-release of poet John Cooper Clarke's wonderful performance film - Ten Years In An Open Necked Shirt. For anyone who thinks poetry is boring this is the perfect antidote as John powers his way through his catalogue of punchy social commentary, humour and machine gun paced poems. The film provides a fascinating look into his philosophy and background and an insight into the punk rock scene where John has provided back up to bands such as the stranglers, The Clash and Joy Division. Sad news about the death of Men At Work flute and sax player Greg Ham. He was a gentle creative and funny man who played the role of Marvo the magician in our film Pandemonium and also wrote a lovely duet sung by David Argue and Amanda Dole. Sadly missed.